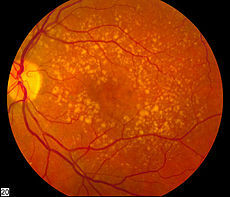 Browsing: / Home / What Foods Help Prevent Macular Degeneration? What Foods Help Prevent Macular Degeneration? What foods help prevent macular degeneration? Leafy green vegetables are a great source of nutrition for healthy eyes. Omega-3 fatty acids are important. Eat your spinach Popeye. These are fish, nuts, and seeds. Salmon, tuna, halibut, mackerel, flaxseeds, pumpkin seeds, soybean oil, walnuts, broccoli, corn, peas, Brussels sprouts, green beans, kale, turnip greens, collard greens, spinach and romaine lettuce. A couple items we need to know about are lutein and zeaxanthin. And getting to the question that has been nagging me lately: What is the difference between optometrists and ophthalmologists? Hint: The ophthalmologist is a physician and the optometrist is not. Back to the topic. Can vitamins help prevent macular degeneration (AMD) ? The experts say that in addition with the right diet, supplements can prevent disease and keep the eyes healthy. One symptom is the following. Distorted vision in the form of metamorphopsia, in which a grid of straight lines appears wavy and parts of the grid may appear blank. Patients often first notice this when looking at miniblinds in their home. It is recommended that everyone takes a multivitamin. Also, omega-3 fish oil and “antioxidant plus zinc” supplements are considered key ingredients to eye health. Always check with your doctor first.